Sometimes, matchy-matchy is a good thing. Case in point: The Calvin Tub Chair (no longer listed in their catalogue) at Pottery Barn. I was wandering through the mall this weekend with a friend and we passed by Pottery Barn and this chair prominently displayed in the window. Nice looking chair with a very nice looking print on the cushions - but the mismatched pattern was fairly screaming out at me! The pattern on the box cushion should be matched so that the front face of the cushion is a continuation of the seat pattern. As you can see, in this case, the circular medallion is simply lopped off. Nothing makes upholstery (or window treatments) look cheaper than a mismatched fabric pattern. And, this chair is upwards of $1,000! This is the Pottery Barn Brooks Slipcovered chair. The pattern on the top seat doesn't extend down the sides, nor does the skirt match up to the drop it's attached too. And, again, this is a pretty expensive chair, rendered cheap looking by bad matching. 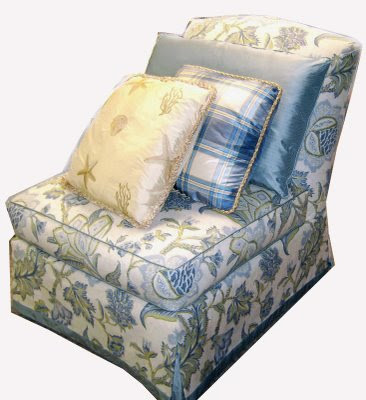 Here is a similar looking slipcovered slipper chair that we did recently. Notice that the pattern on the seat extends down the sides of the seat cushion in the front. While it's not always possible to match up every pattern, at least the front of the piece should match. Here is another example. The client selected a very graphic, yet fairly regular overall pattern. It was important that the front facing pieces match and as you will see - the fern like scrolls extend from the seat to the front face to the skirting - thus creating a harmonious and beautiful piece. 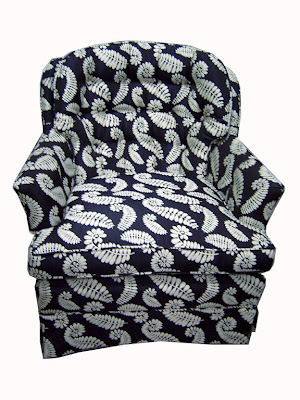 Here is an example of a very unusual block print fabric applied to a traditional wing chair. Clearly, the fabrics had to be very carefully matched, not only vertically, but also horizontally. 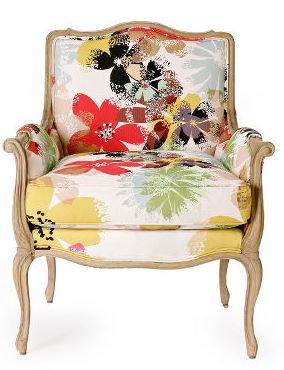 Some retail stores do get it right - such as Anthropologie's Antwerp Chair below. 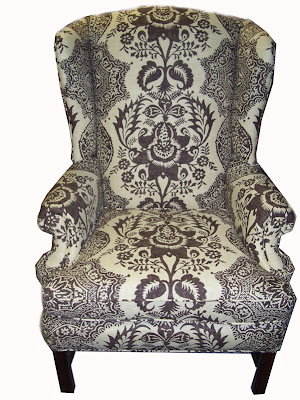 They do a beautiful job of matching the pattern from the seat down the face and onto the upholstered front of the chair. Of course, this chair is significantly more expensive than the PB pieces, at $1,400.00. Matching patterns is more expensive, there is no question. It takes more skill and time on the upholsterers part and it takes more fabric. However, if you are going to spend real money on a piece of furniture - and at $1,000 for the Pottern Barn Calvin Chair, we are talking real money - then shouldn't it look as good as it can? 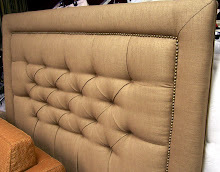 When shopping for upholstered furniture - always pay attention to how the pattern is placed on the piece. If you are having an existing piece of furniture recovered, or are selecting your fabric for a new piece - be very careful with the fabric you choose. A qualified upholster will be able to advise you on how to best lay out the fabric. And don't hesitate to ask to meet with the upholsterer (where available) in order to go over these issues and to make sure that they are going to lay out the fabric appropriately. Saving 20% on the cost of a job might leave you with a piece of furniture that looks 50% less appealing. And, if corners are being cut with the layout, what other corners are being cut? I recently upholstered some dining room chairs for a relative. When a decorator friend of mine pointed out that Idid not run the fabric up on the seat as I did on the back. For some reason I thought it should be like an open book and flow toward the front of the chair from back and flow from bottom up to the top of chair. :( I liked the way they looked till she pointed this out to me. Well, hopefully your relative is happy - that's all that matters in the long run! I really wish some of our previous clients could have read this article! I wonder if many people who buy catalog furniture are discriminating enough to understand about all the little details that go into a really great upholstery job? They are usually unhappy about an upcharge for pattern matching, maybe they just don't notice the difference? 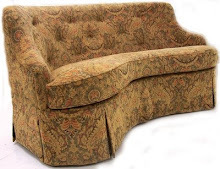 Walter Heller has been in the upholstery business for nearly 50 years. Born in Europe, he brought with him old style European furniture making techniques that fit right in with the new emphasis on natural materials and sustainable design. Located near Boston in Norwell on the South Shore of Massachusetts, Heller Furniture serves both the New England design community as well as individual homeowners who are looking for the very best. * Decorator fabrics & leathers from: Beacon Hill, Lee Jofa, Highland Court, Robert Allen, Kravet, Pierre Deux, Stout, Duralee, Stroheim & Romann, and more! Heller Furniture can work with you to order direct from the mills at deep discounts if your project requires substantial yardage. Call us for details!